Family and friends of Fred Brownell are invited to a graveside service that will be held on Saturday, June 16, 2018, at 11 a.m. at the Edinburg Cemetery. There will be a luncheon reception for the community afterwards at the Edinburg Firehouse starting around 11:45 a.m. Stop by to remember Fred’s life and the many stories he would tell about Edinburg’s history. Fred died at age 80 on Sunday December 24, 2017 at home after being stricken. He was born in Edinburg on March 19, 1937. The son of the late, Merrill and Beulah Conklin Brownell. 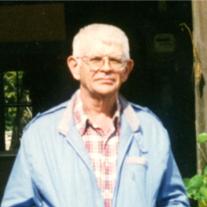 Fred worked as an electrician with his father for many years and operated his own lawn care business from 1952 – 1980. He was a lifetime area resident, a member of the Edinburg Methodist Church and was a very active member of the Edinburg Historical Society since 1975. Fred will always be remembered for his knowledge of local history and love of sharing that knowledge with visitors of the Nellie Tyrrell Museum. Fred enjoyed researching his family genealogy, traveling and spending time with his many family members. He is survived by many aunts, uncles and cousins.